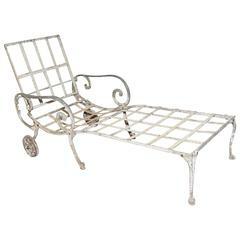 Antique heywood wakefield stick wicker chaise. 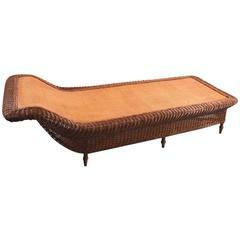 Nice original wicker chaise, daybed, lounge. This example is in very good, original condition showing only very slight signs of age and use. Clean, ready to use condition. 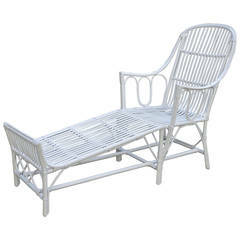 French Art Deco natural wicker and bentwood adjustable back chaise with separate footrest with light blue trim. 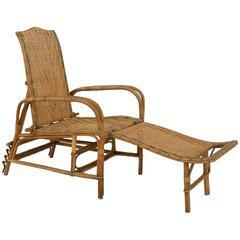 Wicker chaise longue with two armrests and a reclining backrest. 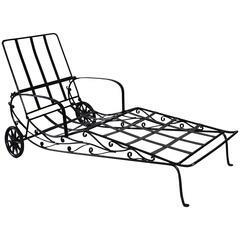 The footrest is detachable. The foots are stabile, however their appearance is worn out.